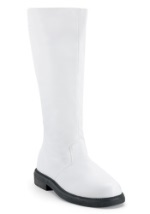 Get a complete look from head to toe with our costume shoes and boots! We have adult and child shoes made for specific costumes as well as shoes that are versatile and can be worn long after your costume event is over. Also be sure to check out our shoe covers and boot tops, which make an authentic and affordable addition to any look.